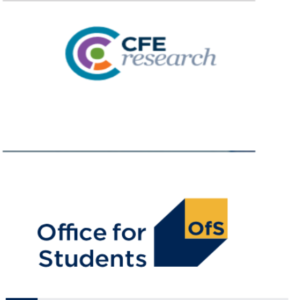 CFE in partnership with The Behavioural Insights Team and economists from the University of Sheffield and LSE are undertaking a four year impact evaluation for the Higher Education Funding Council for England’s (HEFCE’s) National Collaborative Outreach Programme (NCOP) to understand what works, in what context and why. The NCOP is a new four-year investment by HEFCE to meet the Government aims to double the participation of students from disadvantaged backgrounds and increase by 20 per cent the number of students from ethnic minority groups into higher education by 2020. Twenty-nine consortia have been awarded funding to target areas with low absolute levels of HE participation and where participation is lower than expected given GCSE attainment rates. The impact evaluation is designed to develop a systematic and robust evidence base on the impact of NCOP through evidencing what outreach activities work and the associated cost-effectiveness, the degree to which different outreach activities work and under what circumstances outreach works. The impact evaluation team will be working closely with consortia to develop a range of experimental methodologies including randomised-control trials. Consortia will be supported throughout all project phases toward developing their sampling frames and method options through a testing phase prior to implementation of the main evaluation. The impact evaluation forms one strand of the wider programme of monitoring and evaluation to establish longer-term impacts and return on investment. CFE, in partnership with Sheffield Hallam University are undertaking a concurrent formative evaluation and programme of capacity building. You can find out more information about the NCOP impact evaluation via the following link: Impact Evaluation for NCOP.